Like her father, Yeva is a hunter. 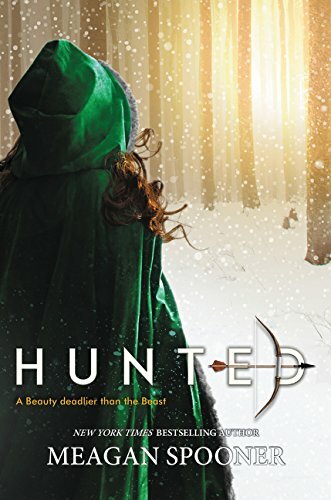 While her sisters seem content with the softer joys of love, family and home, Yeva yearns for the dark forest, for the hunt and for something elusive. Something, as the novel puts it, “more.” When her father vanishes into the woods and Yeva goes after him, only to come face to face with a ferocious beast instead, she finds danger, magic and “something more” in spades. Few stories have been retold as many times as Beauty and the Beast. Readers have seen Beauty in countless iterations: a bookworm who yearns to travel, a shy wallflower, a feisty schoolgirl, and so on. Selfish sisters, weak fathers, stolen roses, crumbling castles, and cruel princes are frequent staples of the story. Spooner’s reimagining does indeed feature a crumbling castle and a father who could be perceived as weak, but the rest of the tropes are absent and this version of the story feels refreshingly new. The three sisters of this story are fiercely devoted to one another, for one thing, and there are no arrogant, villainous suitors determined to slay the beast and win the girl. The novel’s biggest departure from the typical versions of this tale, however, is the fact that this Beauty is every bit as fierce a hunter as the cursed Beast. Set against a lush, gorgeously written backdrop of forest, snow, and magic, Yeva’s goal for over half the novel is to kill the Beast. Her shift away from it, toward the inevitable love story, feels genuine and real. This is possibly the greatest strength of the novel, the fact that this only too familiar sense of insatiable wanting is really what binds Beauty and the Beast together. Yeva is just as flawed and conflicted as the Beast, their characters meticulously crafted and compelling, and readers are likely to root for a happy ending for them. The supporting characters are just as nuanced, it must be noted, from Yeva’s sisters Lena and Asenka to the stubbornly loyal dog Doe-Eyes. There’s a great deal of mythology woven in, notably Russian folktales like the story of the Firebird, and these stories within the larger story flesh out an already vivid, dark, and often beautiful world. The pacing does at times feel slower than an impatient reader is likely to appreciate, especially in the early chapters before Yeva ventures into the forest, and some parts of the wider backdrop feel underdeveloped. That said, Spooner’s knack for characterisation and vivid atmosphere more than make up for this. It’s worth mentioning here that the inherently problematic concept of a girl falling in love with her captor is deftly addressed in this particular version of the tale. The novel also takes pains to show different kinds of female strength, breaking away from the idea that only one kind of strength is worthy and emphasising the overarching theme of dual natures; Asenka’s valiant attempts to hide her own heartbreak for the sake of her sister’s happiness, for example, are every bit as admirable as Yeva’s bravery and fortitude when faced with captivity. In short, this is a lush, tense and surprisingly original reimagining of a classic tale with a flawed and compelling heroine at its heart. Sangu Mandanna is author of the young adult novel, The Lost Girl.